It's been a rough day, but when I saw this in my email, I couldn't help but laugh. 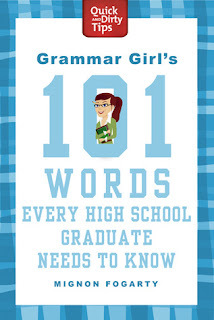 Yes, you are reading that as it was sent: "Grammar Girl's 101 Words Every High School Graduate Need to Know." A blatant grammatical error in a promotion for a grammar book. Luckily, the actual book and every other promotion I have seen for it has the correct subject/verb agreement. I have great respect for the writers' organization that sent this email, and in all the years I have seen information from them, this is the worst error I have ever caught. I am also very familiar with Mignon Fogarty's work and know that she is a true grammar guru. This just goes to show that even the best of us make silly mistakes when it comes to grammar. So don't be so hard on yourself or on others. Mistakes happen, people forgive and forget them, and we try our damnedest never to look so foolish again.